A common expression in the field of child development tells us that play is the work of the child. This really is true. From a young age, babies learn about their environment through play. Play enhances your baby's social, cognitive and physical development. Observe your baby during play time. You will be amazed at all he is learning during a very simple game. A common expression in the field of child development tells us that play is the work of the child. This really is true. From a young age, babies learn about their environment through play. Play enhances your baby’s social, cognitive and physical development. Observe your baby during play time. You will be amazed at all he is learning during a very simple game. Your baby learns about the world through play. 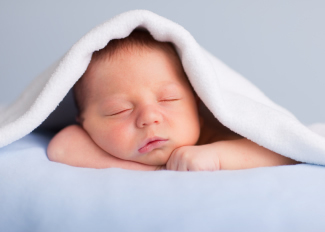 Babies use all five senses when playing to learn about the world around them. When playing with your child or selecting playthings, consider how each of the five senses can be used to explore the toy or play the game. They love to explore different textures and hear the sounds objects make. Most parents of babies will tell you they absolutely love to taste everything they touch. The baby will interact more as he grows. 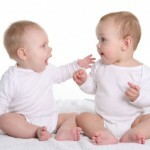 Your response and how you engage the baby in her early attempts to communicate will affect his language development. As you “talk” back and forth, he learns a lot about communication and having a conversation. This will encourage the baby to express herself more. Babies learn a lot using the sense of touch. The baby play gym is a good first toy. The [tag-cat]baby[/tag-cat] will swat at the colorful toys suspended above his head. As his grasp develops, give him a variety of toys in different shapes and sizes. This allows the baby to develop small motor skills while playing. Hold the toy out in front of the baby. By reaching out and taking the toy from your hand, the baby develops eye hand coordination. Your baby is gaining a wide variety of skills through [tag-tec]play[/tag-tec]. As your baby plays, he learns that he has power. He can make things happen. If he shakes a rattle, it will make a noise. If he drops the ball, it will bounce and roll away. As he learns to crawl, he will go after it. The baby is learning cause and affect through play. He also learns imitation when you play together. Mommy shakes the rattle and baby imitates her motion. Later, mommy imitates some of baby’s motions or sounds. 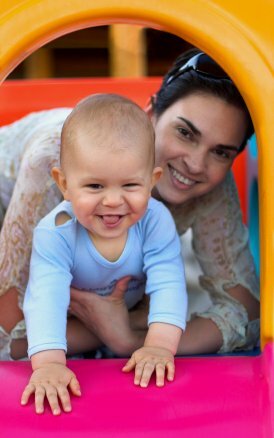 Introduce a variety of activities to help encourage your baby’s development. You are your baby’s favorite thing to play with. Offer a good selection of activities that include each of the five senses and expose the baby to music and books at an early age. You can use small instruments made for babies or play the drums with spoons on a pot. Sing silly songs in the car and dance with the baby in your arms in the living room. Babies love playing with older [tag-ice]children[/tag-ice] and other babies. They learn to explore the world around them from watching other children play. My son, for example, is very entertained by his older sisters. They interact with him in a different and beneficial way. There is a gradual progression as the baby grows from watching and observation to eventually playing with other children. Classes for babies have become very popular in the past generation. Mommy and Me music and movement classes, Gymboree and baby gymnastics have gathered quite a following. While these classes won’t make your baby the next genius, they can be fun. They are also a good way for you to learn how to play with the baby and spend some time interacting together. 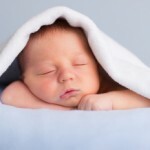 In addition, you will meet other mommies with babies around the same age.